The City of Cusco, at 3,400 m above sea level, is located in a fertile alluvial valley fed by several rivers in the heart of the Central Peruvian Andes of South America. Under the rule of Inca Pachacuteq (Tito Cusi Inca Yupanqui), in the 15th century, the city was redesigned and remodelled after a pre-Inca occupation process of over 3,000 years, and became the capital of the Tawantinsuyu Inca Empire. The Imperial city of the Incas was developed as a complex urban Centre with distinct religious and administrative functions which were perfectly defined, distributed and organized. The religious and government buildings were accompanied by the exclusive abodes for royal families, forming an unprecedented symbolic urban compound, which shows a stone construction technology with exceptional aesthetic and structural properties, such as the Temple of the Sun or Qoricancha, the Aqllahuasi, the Sunturcancha, the Kusicancha and a series of very finely finished buildings that shape the Inca compound as an indivisible unity of Inca urbanism. Our private guide will pick us up at the arranged time to carry out our tour of the city of Cuzco. This will be a walking tour; first we will visit San Blas is known as Cusco's artisans' quarter since many of the best craftsmen have their workshops and small art galleries , narrow streets surrounding the 16th-century church of San Blas. 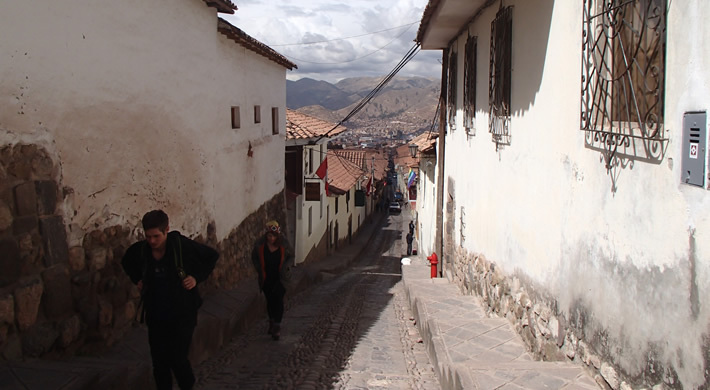 We will walk through its narrow and steep streets with old houses built by the Spanish over important Inca foundations and stop at the famous Stone of the Twelve Angles for some pictures. Then you will visit the Sun Temple or Qoricancha, an important construction during Inka times, built to honor the Sun God. we continue our walk to the Plaza de Armas, Cusco’s main square in the heart of the city with its beautiful fountain and the impressive Cathedral. Our last stop will be the local market San Pedro, a huge market that operates every day of the week with a variety of items being sold, such as beautiful pastries, fresh juices, delicious cheese, huge breads, tropical fruits and vegetables, herbs and spices,etc. You can take as much time as you want here to roam around the numerous small stands, get inspired by the very special flair of this place and buy souvenirs like traditional jewelry, textiles and ceramics. You will return back to your Hotel.